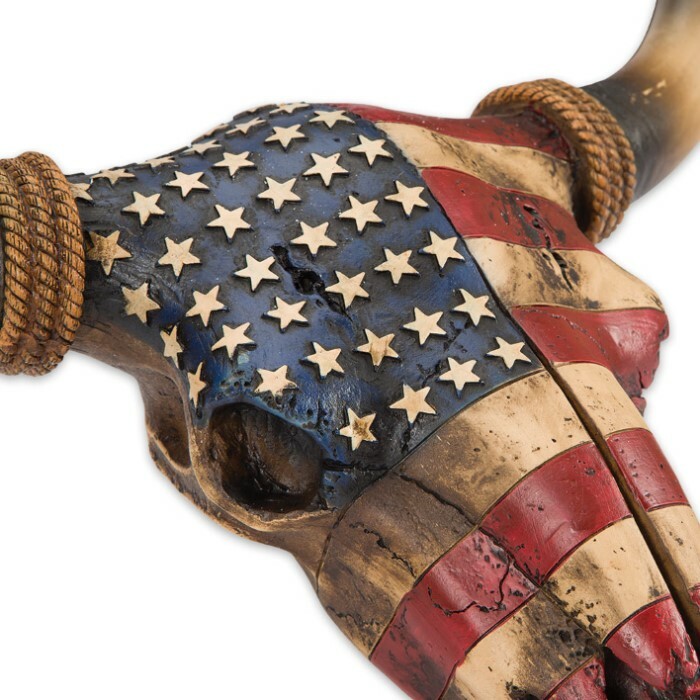 American Flag Bull Skull Resin Sculpture | BUDK.com - Knives & Swords At The Lowest Prices! Display the eye-catching US Flag Bull Skull Plaque and show your patriotism, while dressing up your home or office with a bit of rustic Wild West flair. 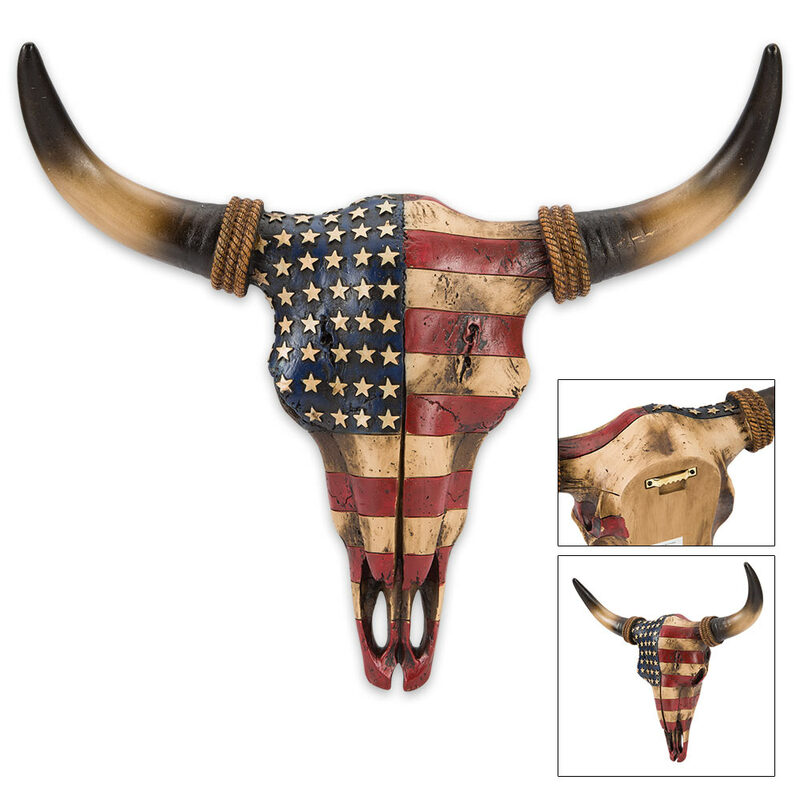 The iconic bull skull has long symbolized rugged independence, wide-open spaces and the untamed American West. This one is exquisitely detailed - loaded with authentic touches like joints and cranial seams; keratin-textured, removable horn shrouds; and even simulated cartilage fibers in the bull’s sinuses. It’s also impressively sized with a 16 1/2” horn span. If not for the vibrantly colored Stars and Stripes motif - delicately painted over the entire skull (save the horns) - you’d think the “American Bull,” as he is affectionately named, was the genuine article! Ever tried to mount a real bull skull? It’s no picnic, and typically ends in pieces. Our cold cast polyresin version is far tougher than old dry bones, and it’s easy to mount, thanks to its flat back (rests flush against any wall) and discreet metal mounting hook. Nothing embodies the harsh conditions and challenges all life must face in America’s wild, arid west better than a bull skull. With its red, white and blue US flag theme, the American Bull goes a step further, symbolizing the free spirit, grit and determination of ALL Americans - not just westerners. No “bull,” you won’t find this handsome skull plaque anywhere but here - unbeatably priced, as always! 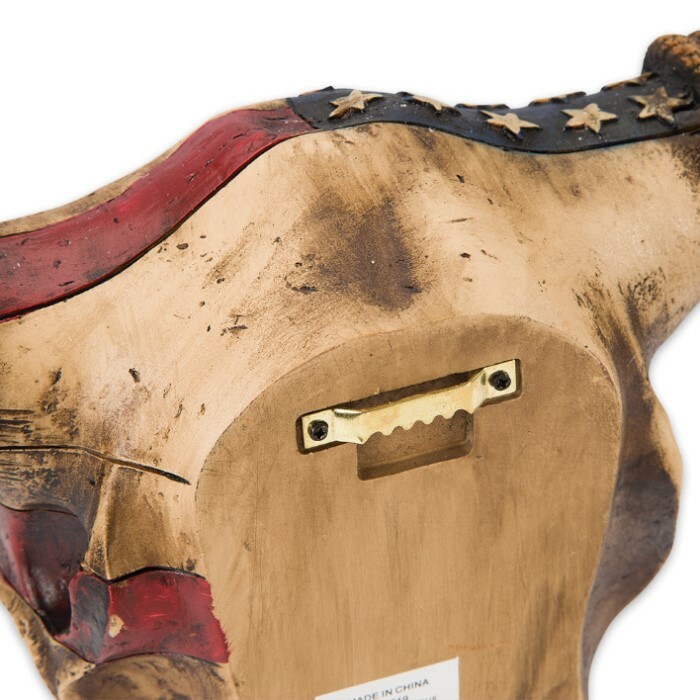 So don’t wait another minute; the walls of your home, office, RV, garage, workshop or rec building just aren’t complete without the American Bull hanging from it.